Chocolate Orange Cake! Just making sure we get our 5-a-day in! In a bowl, mix the flour, cocoa powder, sugar, butter, eggs and milk. Mix until you have a smooth consistency, then add the orange juice and the zest of 1 orange. Pour the cake mix into a lined cake tin and bake the cake in the oven at 180°C for 30 minutes. Leave the cake to cool, then unmould it from the tin. Mix the jelly with half the amount of boiling water recommended on the packaging to give a strong mix. Leave the jelly to set in a non-stick frying pan in the fridge. Then turn the jelly out of the frying pan onto the top of the cake. Melt the dark chocolate in a bowl, then add the warm cream and mix to give a smooth mixture. Pour the mixture over the jelly and cake to cover the surface. 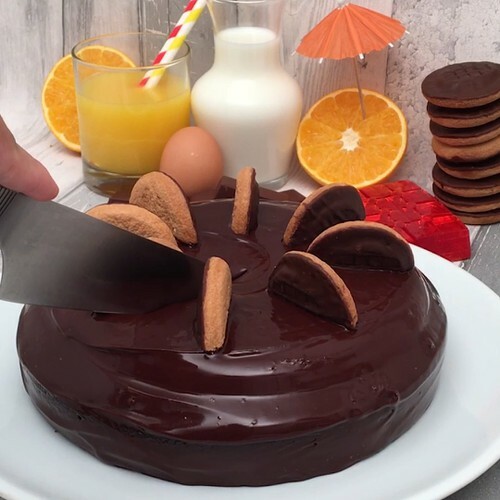 Decorate the cake with Jaffa Cake® pieces and enjoy.